The seasons are turning, and more caloric snacks are once again on the rotation. 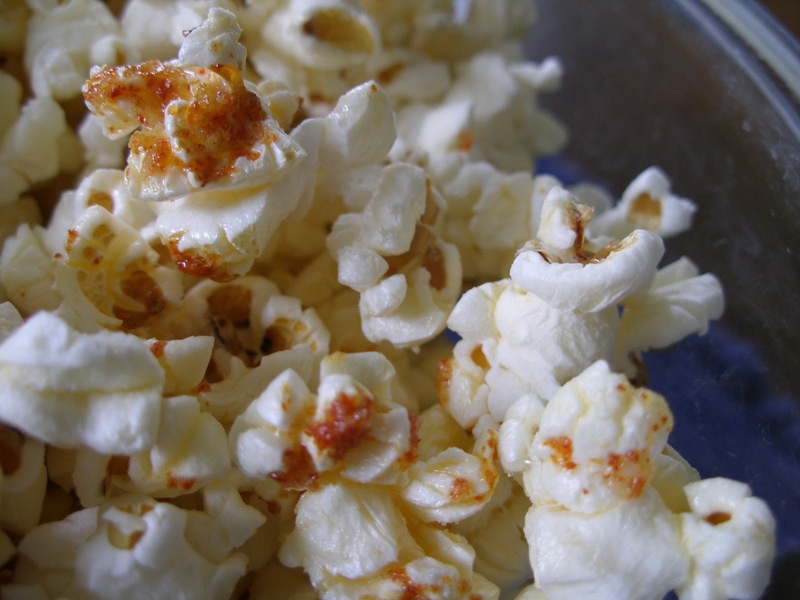 Here's a picture of our own Pennsylvania Dutch Butter-flavored popcorn, seasoned with an ancho-garlic butter. Of course, just because the popcorn has its own buttery flavor, that's no reason to forgo adding more butter. This topping used our own garlic, finely minced, and some of the ancho powder I made this year, cooked into the butter along with the garlic so that the flavors dispersed nicely. I was struck by how much sweeter this ancho chili powder was than the commercial stuff I've relied on in the past. It really gave a distinct fruity-sweet note to the popcorn. Not what I'm accustomed to, but pretty tasty. If you need directions for perfect oil-popped popcorn, I posted them a while back. I'm a bit under the weather at the moment, but I should have some more substantive posts up soonish. 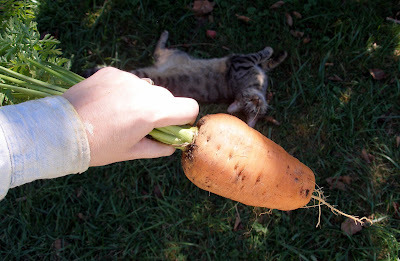 One never knows how big the carrot is until it's pulled from the earth. All in our household were instantly smitten by this one. 10.6 ounces, in all its glory. Went well with garden eggplant and tofu with toasted sesame oil and ginger. 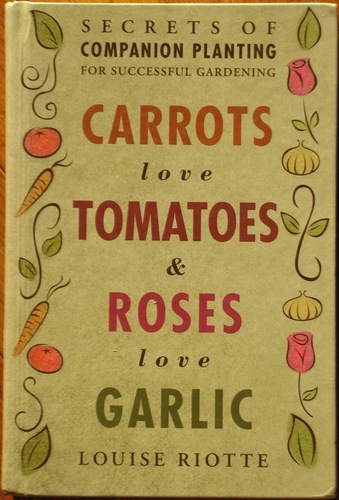 I suspect that everyone who cooks on a regular basis for many years on end develops some favoritism in the spices and seasonings department. I certainly have. I'm extremely partial to garlic, fresh sage, cardamom, and ancho chili powder - though they rarely all make it into the same dish. I've been chipping away at the garlic gap for a few years now, and have seen harvest of ten pounds or more for the last couple of years. Fresh sage is only in season for about six months of the year, though preserving it as a compound butter does help extend the joy. Cardamom is entirely out of my hands, but ancho powder has been tantalizingly near since I started gardening seriously. First, a definition. An ancho chili pepper is botanically one and the same as a poblano chili. It becomes an ancho chili when it is smoked and dried. Additionally, I'm pretty sure that the chili only classifies as an ancho after it has been allowed to ripen on the plant from its early green color to a deep red. Only then is it smoked and dried, and, at times, powdered for ease of use in the kitchen. Poblanos/anchos are quite mild as chili peppers go. They are noted more for their marvelously rich flavor than for powerful heat. This means you run no risk of dispersing mustard gas-like irritants into the air while drying them. However, you should still wear gloves when cutting them up. They pack enough of a punch to let you know about it should you get the oils on sensitive skin, or worse yet, eyes or mucus membranes. 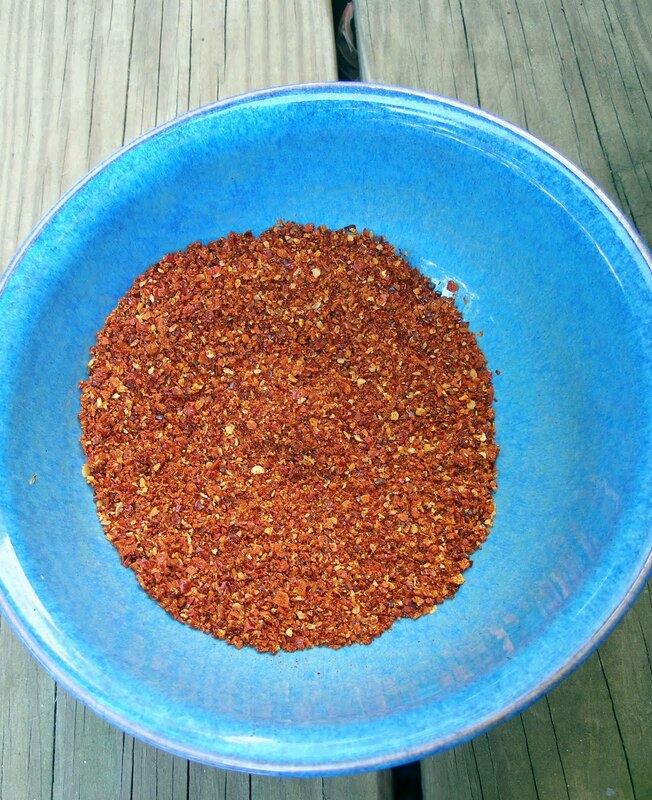 My first attempt at making ancho chili powder came last year. It was an utter failure. I duly waited for the chilies to turn red, then smoked them whole and strung them up to finish drying in a cool dim room of the house. Big mistake. Though they looked fairly well on their way to drying when they came out of the smoker, there was still sufficient moisture inside to allow them to molder from the inside out. Compost. 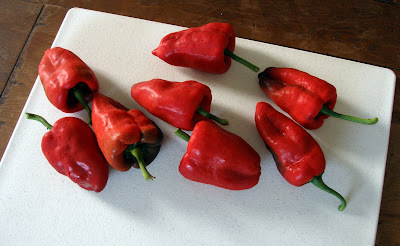 Our climate, at least last year, wasn't hot enough to allow chilies to dry down unaided inside the home. This year I started with a different approach. 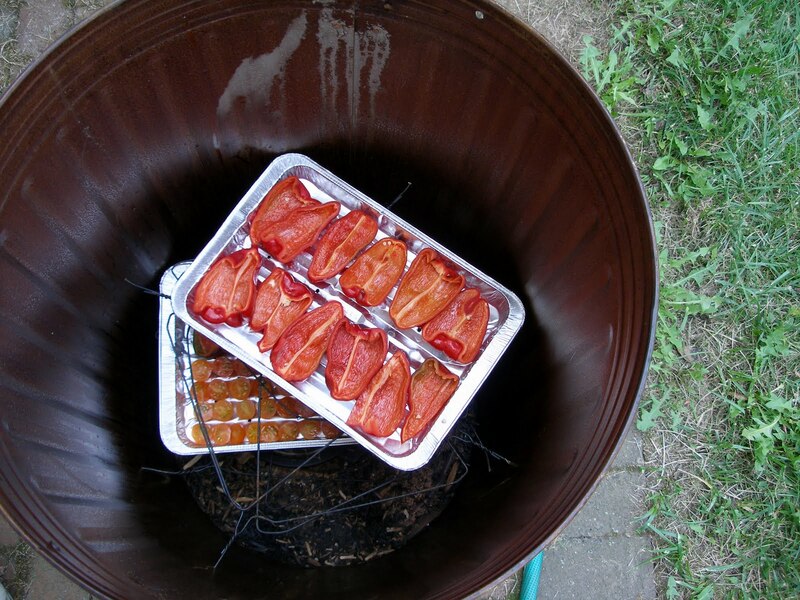 I left the peppers whole, but cut several long slits in the sides before putting them in the smoker. This helped speed the drying somewhat, and also allowed for better penetration of the smoke. But it still took far too long to dry the peppers. And I found the seeds of the chili made for a rustically uneven texture after grinding. Scratch that approach. So for my second batch, I cut the peppers entirely open, removing most of the ribs and leaving only a small number of seeds intact to add what heat they might. This worked well. For smoking material, the apple wood chips from our own apple tree give a marvelous flavor. But other fruit or hardwood chips would probably work just as well. Can you imagine it? A patchwork quilt of homegrown chili powders across the land, each one imbued with distinctive terroir! The smoked pepper slices needed about 24 hours of further drying in a dehydrator. 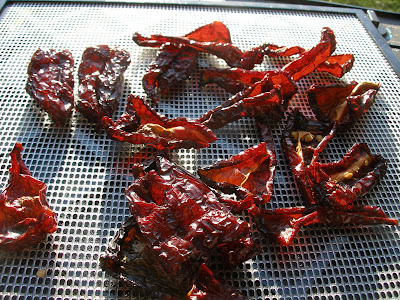 This was accomplished over two days, with the dehydrator situated on the driveway. The Excalibur dehydrator has a temperature control, so I figure I save energy by placing the box where it's already pretty hot from the sun. The fan still needs to run of course, but I doubt much energy is required to nudge the temperature up to 125 F, which is about optimal for the peppers. When done drying the peppers should be just barely pliable. They lose about 85% of their weight through trimming and dehydrating. From this state, some sources recommend "toasting" the dried chilies in a dry skillet, to crisp them up just a bit more before pulverizing. I omit this and simply put the freshly dried chilies into a food processor. This produces a coarse grind. After that, it's a question of my patience and free time. I have a spice grinder which can take the relatively coarse results from the food processor down to significantly finer powder. But if I want to be really finicky, I have to screen that powder through a very fine mesh and reprocess whatever doesn't pass through the screen. I've troubled myself to make only a very, very small quantity of this finely textured ancho chili powder. And I rarely cook anything in which the exact texture of a powdered spice is going to affect the outcome of the dish. My homemade ancho has a much stronger aroma than any powder I've been able to purchase. It also has a tendency to clump a bit; so I wonder whether commercial products add an anti-caking agent, or whether they simply use a different processing technique. I use ancho powder in bean dishes, on quesadillas, and even to flavor the butter I drizzle over our homegrown popcorn. (I know you popcorn purists will cry, "Sacrilege!" But give it a fair shake at least once - that's all I'm saying.) Sometimes I'll even sneak it into futomaki in place of togarashi; ancho's flavor combines very well with toasted sesame oil. From a pound of whole poblano peppers I get about 1/3 cup of finished chili powder. I doubt we'll generate a year's supply from the three plants that have done well in this year's heat. I estimate we'd need double that number in a good year to keep us in ancho powder till the season rolls around again. I returned home to Pennsylvania to find that fall had arrived in my absence. There's a lovely nip in the air, and the tulip poplar is already shedding its leaves. I suspect our hot dry summer will mean a less impressive fall color show for the leaf peepers. My dad and I had a great time on our trip. On the way up to Maine we stopped at the Mark Twain House in Hartford, Connecticut. I had no idea the old curmudgeon was so well-to-do, nor that a good deal of his money was his wife's. Whenever we made pit stops along the way, I scouted for oak trees, since it's acorn foraging time. Though we could eat them, I'm gathering them for the laying hens, since they're highly caloric and the hens love them so. I'm not up on my oak species, but there are some great acorns to be had in New England - far more impressive specimens than the oak in our backyard provides. I picked up about four pounds of acorns in very little time. A few of them were even from the Mark Twain House grounds. My father wondered whether they would improve my chickens' vocabulary. We pitched in at my aunt and uncle's house, helping to clean out, paint, and re-organize their garage. It was quite a project. But we got good meals out of it. All my family cook pretty well, and eat heartily. I tried to finagle my aunt into letting me take the huge ceramic crock that was cluttering up her garage off her hands for a few bucks. She's no fool though, so I didn't get very far with that proposition. However, my other aunt said, "Oh, I have one of those on my back patio. Do you want it?" I didn't want to look a gift horse in the mouth of course, but I told her I'd want it for making sauerkraut, and asked if it had any cracks in it. She said it didn't, and that she'd bring it to me at Thanksgiving. Pretty sweet! My aunt and uncle are north of Portland, but since we had to pass by the city anyway, it was completely reasonable that we stop in for a browse at Rabelais bookstore. 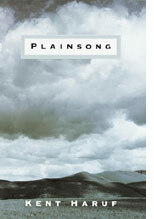 I love books and browsing at independent bookstores. Make it a small independent bookstore that's devoted entirely to food, and I'll travel for hours to get there (at least occasionally). This time I came away with Canning for a New Generation . I can't wait to try the recipe for brandied sweet cherries...Perhaps next year our sweet cherry will bear. The other highlights of my trip to Maine were my tours of Wyvern Heath and Henbogle, two locations I got to know through the blogosphere before I ever laid eyes on them. Wendy and her family welcomed my father and me to their quarter-acre homestead on our way to visit our family. It was great to see their rampaging hubbard squash vine, the mixed poultry flock and a batch of tiny rabbit kits. The homestead felt very welcoming. Then Wendy had us inside for a cup of tea and incredibly decadent slices of chocolate cake. On Saturday morning I was able to slip away from the family and visit Ali and her husband, Dan. Henbogle was equally welcoming, and it was a treat to see the hoop house and the rest of their garden. I was able to suss out how big our planned hoop house is going to be by standing in the middle of Ali's and ignoring everything behind me. Our hoop house is gonna be small, but it'll fit what space we've got. One reaction I had in common to both Wendy's and Ali's layer flocks is that my Red Star hens have really boring appearances. Their Americaunas and barred rocks, Buff Orpingtons, and even the Black Stars put my girls to shame when it comes to looks. We may have to change up the poultry next time around. It was a real pleasure to see these other gardens and homesteads. They were both different in many details from my own backyard, but they both felt home-like to me. I don't think it's just because I'd seen pictures of these places before. I guess there's something about small parcels of land being used for food production that feels right to me. My only regret is that both visits were short. I felt that conversation could have stretched on for hours at either location. I came away with largess from both Wendy and Ali. A small pumpkin from Wendy's garden as consolation for my failed winter squash crop this year, plus the seeds to grow that variety next year. I was really impressed by seeing this variety, which almost seemed like a bush pumpkin, if there were such a thing. Low-sprawl pumpkins are welcome in my garden anytime. And from Ali a luscious pair of half pints of homemade jam - strawberry-balsamic-black pepper, and blackberry-lime. As soon as we polish off the jar of jam in the fridge, I'm cracking one of these open. All in all, it was a great trip with Dad, carbon footprint misgivings notwithstanding. But it's nice to be back home too. I'm working on my ancho chili powder post and should have it up in a day or two. I'm taking off for a few days on a road trip to visit family in Maine. These days I am very conscious of the resource-intensive nature of travel. But having had a sudden and unexpected death in the family this summer, I am also keenly aware of how important family is, and that there is never any guarantee that I'll see the people I love again. My family is far-flung, with relatives in California, and scattered over the northeastern part of the US from Ohio to DC to Maine. "Love miles" are a reality for me, whether I choose to travel those miles or not. As much as I am theoretically committed to a low-energy, local lifestyle, I have not been able to reconcile those values when it comes to maintaining ties with family. Yes, I am a hypocrite. The clincher with this trip is that my father is driving to Maine whether I go with him or not. And truth be told, I'd worry about him doing the drive by himself. So I'm going along, and I'm looking forward to it. I very rarely have any one-on-one time with my dad, and I'm not about to turn down an opportunity like this one. We have some fun things to do along the way. It should be good. I will try to be a little more regular in my postings when I get back. Updates are in order for honey bees, the turkey, fig trees in containers, and potatoes in buckets - round two. I plan to a post on the ancho chili powder too, since someone asked. 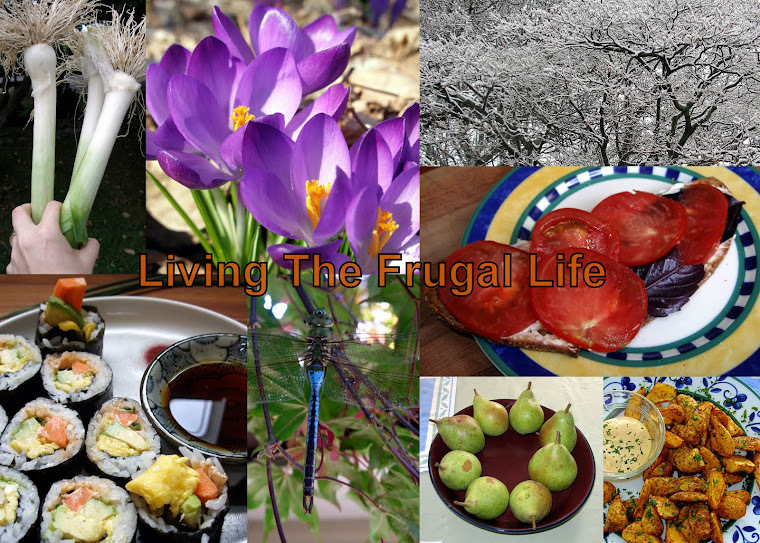 There are still so many projects to try and cram into what's left of the fair weather of this year!